Seven Card Stud is a variation of the popular game of poker. It is a common game featured at many online poker rooms and many brick and mortar casinos. It is very rare to see the game played in anything other then fixed limit, which means players must stick to betting structures, which vary depending on the blinds. 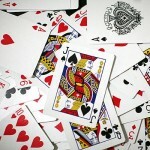 To start each hand, the dealer deals each player 3 cards from a standard 52 card deck. Only 8 players can play on a table of Seven Card Stud Poker because of the obvious reason that there are only enough cards for 8. Two of the opening three cards are dealt face down and one is dealt face up. A round of betting now takes place, which starts of with one player having to either “bring-in” or raise the hand. Bringing in the hand means betting the minimum, whereas raising the hand is clearly betting more chips. Then 3 more cards are dealt face up to each player one by one with a round of betting in between. Then the last card is dealt face down to each player, which is followed by the last round of betting. At PokerStars you will be able to practice your Seven Card Stud skills in free money mode before you decide that it is time to start playing for real money. Once you start playing for real money you will get a free $50 bonus if you create your account using the PokerStars marketing code PAWSUB465.